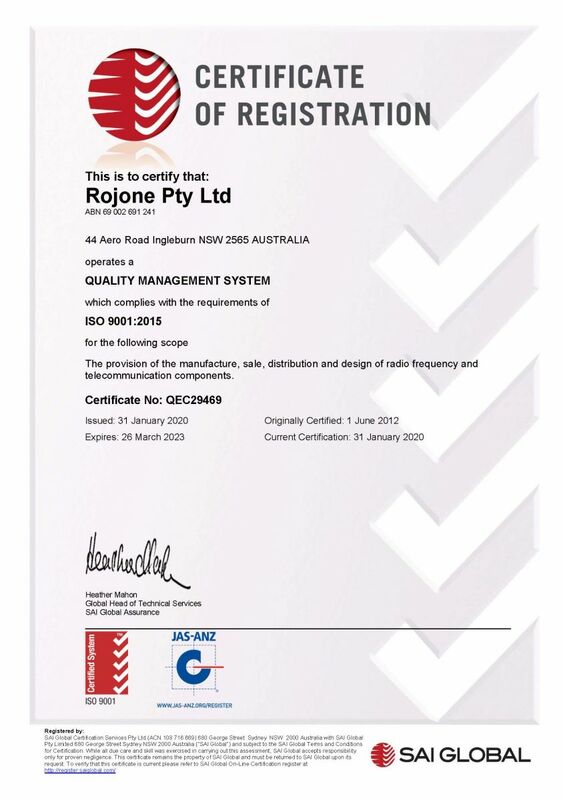 "Rojone Pty Ltd is committed to complying with the latest in industry standards"
Rojone is ISO 9001:2015 certified. These quality management standards, maintained by the International Organization of Standardization (ISO), provide a number of business process requirements for consistent product manufacturing and delivery to meet customers’ expectations. "The provision of the manufacture, sale, distribution and design of radio frequency and telecommunication components"
Rojone is committed to providing our customers high-quality products, superior service, and world-class technical support. 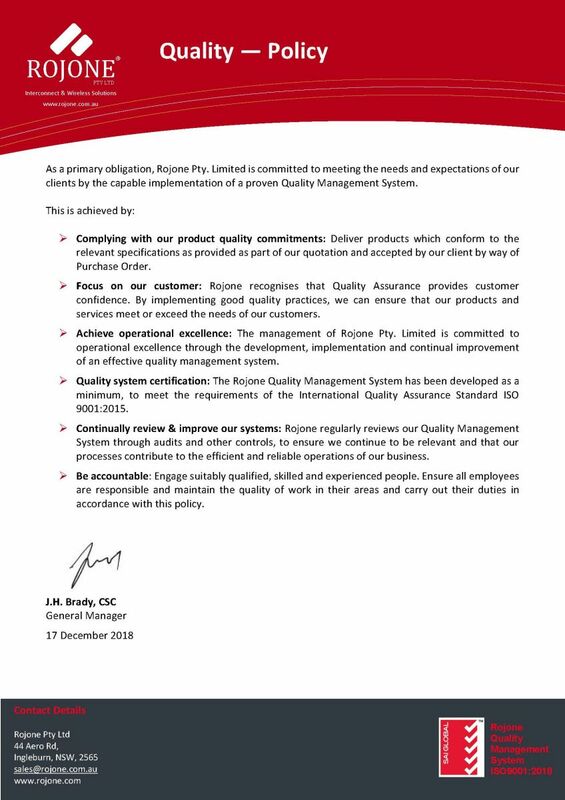 We will continually monitor and improve our systems and processes to ensure our products and services meet or exceed all defined requirements from customers, statutory or regulatory associations. All Rojone Employees are dedicated to these principles and strive to continually improve the effectiveness of the Quality Management System to achieve total customer satisfaction. 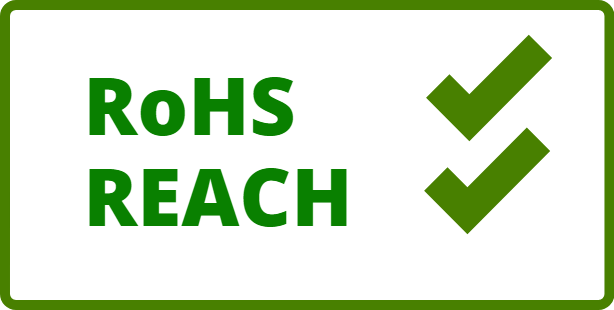 Rojone will provide RoHS and REACH statements for products supplied as required. Statements are avaible by contacting sales@rojone.com.au. 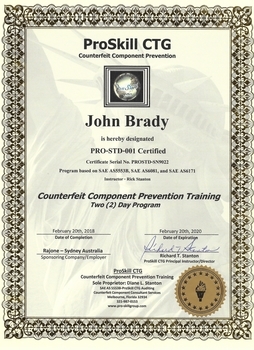 Counterfeit product has become a growing concern in customers' supply chains as customers or distributors secure low-cost alternative sources. Rojone is committed to obtaining only the highest quality products for our customers. Rojone purchases product only through our Authorized Manufacturers and Suppliers, thereby ensuring that the product is new, authentic, and fully warrantable under the direct supplier and that accurate up-to-date technical information is readily available. 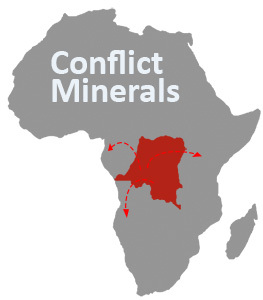 Due to violence and human rights violations in the mining of certain minerals from the Democratic Republic of the Congo (DRC), and surrounding countries, the U.S. Securities and Exchange Commission (SEC) has implemented reporting and disclosure requirements for Conflict Minerals, as directed by the Dodd-Frank Wall Street Reform and Consumer Protection Act of 2010. Rojone is not required to report to the SEC as we are a privately held small business. SBC will provide a completed Conflict Minerals Reporting Template. We are committed to the sourcing of “Conflict Free Minerals” through our suppliers to comply with the SEC rules and regulations with Conflict Minerals. Rojone is a member of the IPC Organisation, membership to IPC ensures we are kept current with latest industry standards for Cable and Wiring Harnesses. Rojone has it is own in-house IPC trainer and is committed to certifying all its employees. As a member of the IPC organisation, we are committed to producing products to this standard. The IPC-620 standard describes materials, methods, tests and acceptability criteria for producing crimped, mechanically secured and soldered interconnections, and the related assembly activities (corresponding lacing/restraining criteria) associated with cable and harness assemblies. To receive the LoRS Rojone needed to meet the standards of supply demanded by the Australian Defence Organisation (ADO). Products and services need to be supplied on time, on budget and to specification.